The Oregon Coast Aquarium is offering a unique way to say, “I Love You.” Sea lion kisses are featured during the Valentine’s Day sea lion encounters February 14, 2010. On these special encounters, visitors get up close to the ocean’s creatures and learn about them from Aquarium staff members who care for them. 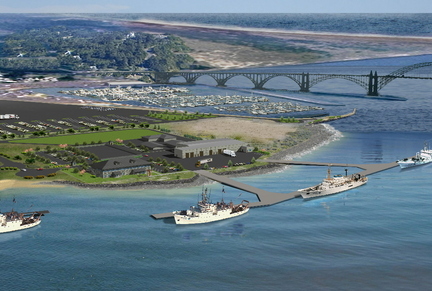 Newport, Oregon still plans to break ground next month on a facility that will host NOAA's Pacific research fleet. That's despite a recent ruling that the federal agency failed to fully explore alternatives to Newport's site. Here's the problem: It's in a floodplain. But Newport wonders whether that's a problem at all. Reporter Chris Lehman went to see for himself. The Yaquina River Museum of Art, Toledo, opens the winter art season with a traveling museum exhibit Estuaries & Quiet Places by Michael Gibbons on December 12, 2009, 10:00 am-5:00pm, part of Toledo's Home Town Holiday, at the School House, 151 NE Alder Street. A champagne reception to meet the artist begins at 12:noon and the public is cordially invited to attend. Original silk scarves by Paulette Hanson and handcrafted jewelry by the late Sondra Humphrey will also be shown. Raffles for a hand made quilt and an original silk top by Hanson will benefit the museum's program for art programs for children and adults in Lincoln County. Newport's pride at becoming the new home of the government's oceanic research fleet took at least a procedural hit today, as a federal watchdog agency said part of the city's planned site is within an area that might be damaged by a large flood at the mouth of the Yaquina River. ...Thirteen chefs each will offer their interpretation of the bivalve, interpretations that range from a miso-pickled oyster served with ginger pudding to portobello oysters to the Bloody Oyster with a pearl — that one involves the Bloody Mary flavor profile — to the Asian Rouge Ramaki oyster, which will be wrapped in bacon and served in a wonton. The Oregon Coast Aquarium introduced two 18 month-old turkey vultures to their new permanent home Friday morning. The introduction went without a hitch under light rain as CJ McCarty, Aquarium Curator of Birds carried them on her glove to their newly constructed aviary. Today the names, “Ichabod” and “Olive” were selected from public entries in a “Name the Turkey Vulture” contest. The turkey vultures, male and female siblings, are rescued birds from the Raptor Education group in Antigo, Wisconsin.